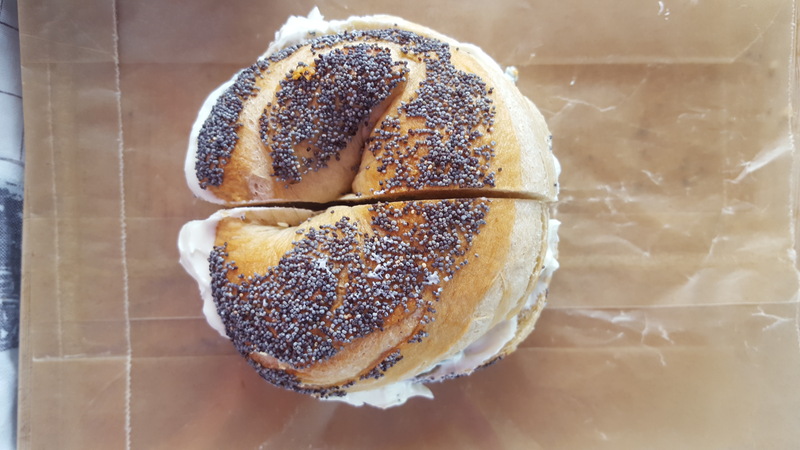 Big Island Bagel News – Yo Bagels! 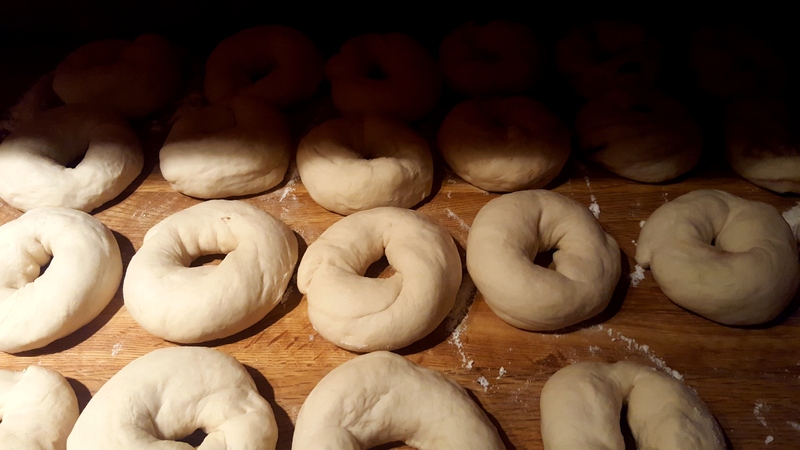 We have been extra busy in the kitchen working on all sorts of bagel projects. In 2017 we were blessed to offer bagels through eight different locations, including our usual Captain Cook Sunday Farmer’s Market. This wouldn’t have been possible without the help of our strong community here on the island working to support each other as small, local, and sustainable business. 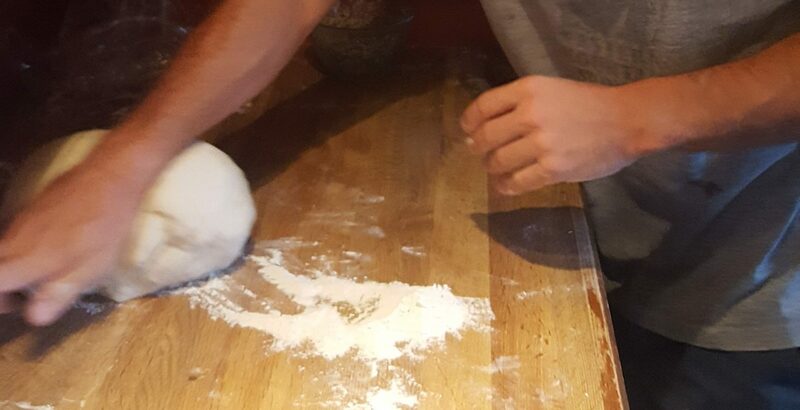 Making the best bagels in Hawaii is a lot of work, but it is made easier with wonderful customers and collaborators. This year we are moving into 2018 with a new pop-up on Saturdays at the Keauhou Farmers Market from 8am-12pm at the Keauhou Shopping Plaza. This market is located in front of Long’s Drugs and features a diverse group of farmers, makers, fisherman, butchers, and more with ample produce and delicious food. Join us as support small, support local, and support farmers & community here on the Big Island. Aloha Bagel Friends and Fans! We are doing great at the Sunday Market in Captain Cook. The past few weekends have been very busy and we have been selling out by 12:00!! Mahalo to all our of friends and customers who have continued to support us on our small business journey. 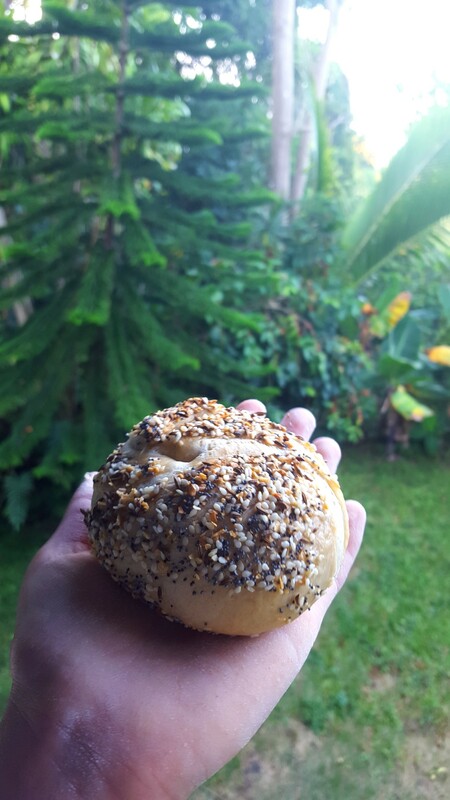 We are so grateful for the people in South Kona who love our bagels! We have some exciting news over the next few weeks so stay tuned. We are not going to be at the market on Sunday 3/5/17, and Sunday 3/12/17. But we will be back on 3/26/16. Tomorrow, 12/4/16, is our absolute last bagel day of 2016 before we leave for vacation. Don’t worry, we’ll be back in January. But we will be gone for a whole month! 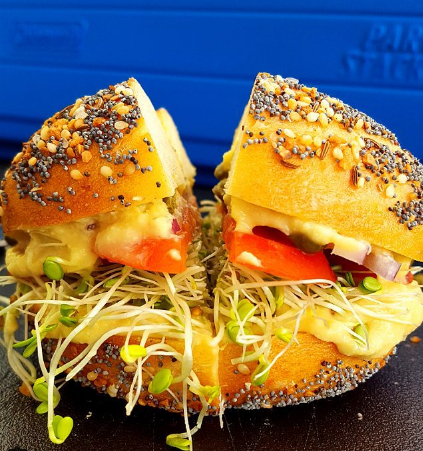 Come by the Pure Kona Green Market for you’re last bite of bagel goodness until after the new year. Aloha! We had a great experience being part of this year’s Kona Coffee Festival. We pitched our bagel tent at the Holualoa Stroll last Saturday where we got to meet heaps of new customers. Joe and I had to start extra early to get all the bagels ready for the event. It was all worth it because we sold out of everything before 2:00 pm. We are so thankful that we get to share our product with residents and visitors to the Big Island of Hawaii. We followed the Stroll with a great day at the Pure Kona Green Market in Captain Cook last Sunday. We can’t wait to be there tomorrow with another batch of the best bagels on the Big Island. Come visit from 9-2, we’ll have all your favorites and a few surprises. 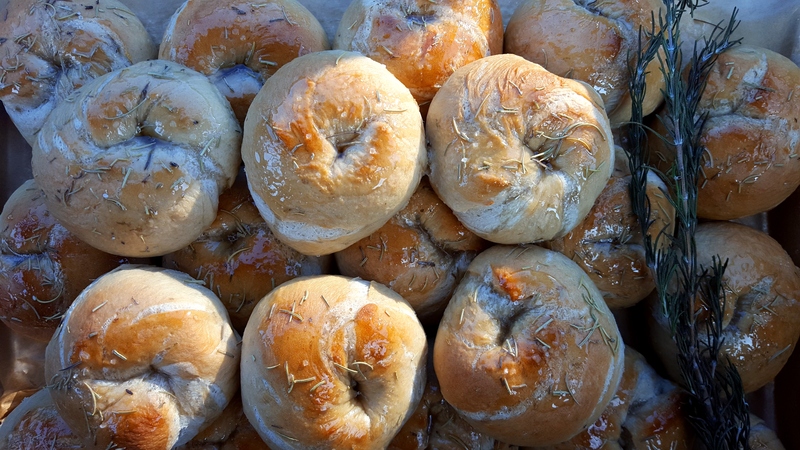 Awesome flavors today at the market with lots of requests for our Rosemary Honey and Sea Salt bagel after they sold out. We have some devotees who come back every week for that flavor. We also served up Caramelized Onion, Herb and Parmesan, and Sweet Coffee Cinnamon as our flavors of the week. With our regular rotation of Everything, Sesame, Poppy, Cinnamon Raisin, and Garlic we have a flavor for everybody. Hope to see you next week for Bagel Sunday and the best bagels on the Big Island! Aloha Big Island! Last Sunday, October 9th, 2016, was our best week yet. There were two special flavors, Sweet Coffee Cinnamon and Herb Parmesan. We had lots of return customers and plenty of new faces. We want to thank the community here in Captain Cook for being so supportive of this venture. 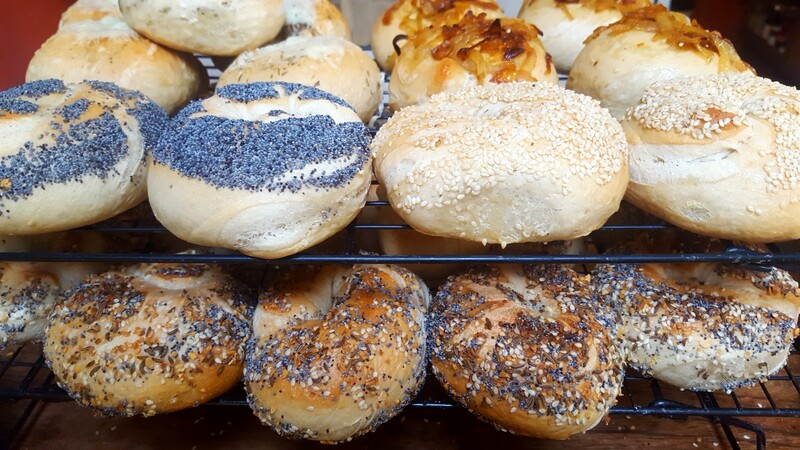 We love baking these beautiful bagels and are grateful to be able to share them with everyone who visits the market on Sundays. We want to inform you that Yo Bagels! will not be at market on Sunday, October 16th. We are taking the weekend off. Don’t worry though, we will be back to the South Kona Green Market the following Sunday, October 23rd, 2016 with some awesome flavors. Make sure to check us out and try the best bagels on the Big Island! 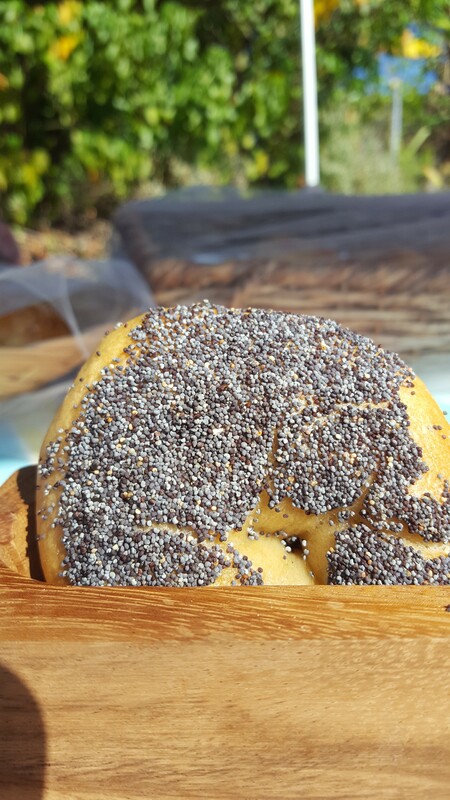 We cranked out another big batch of bagels this week for the South Kona Green Market in Captain Cook, Hawaii, on the Big Island. The alarm seemed too early this morning, but we crawled out of bed and managed to make 10 different flavors for the market. 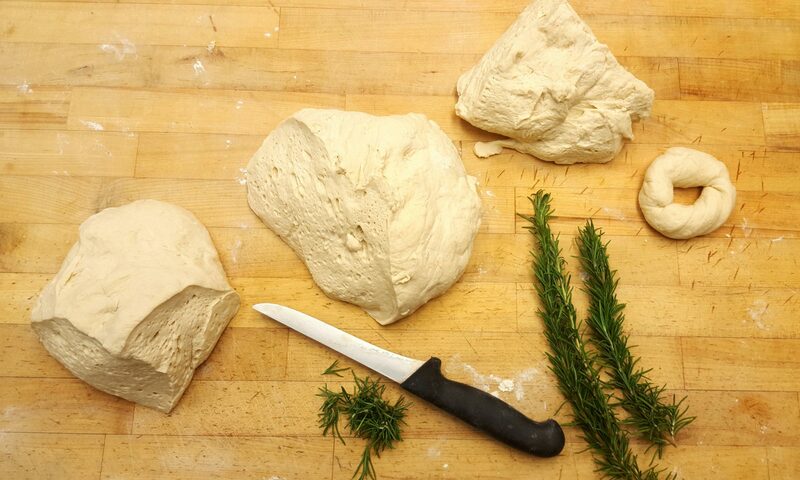 This week our new flavor was Herb and Parmesan, with herbs rolled into the dough and aged Parmesan melted on top. As usual, the everything bagel was the first one to sell out. They were all gone before noon. Make sure to come by our stand before 12:00 to get the best selection of flavors. Today we are wiped out, but we can’t wait for next week! Hope to see you there to try to the best bagels on the Big Island! This week we brought in a yummy new flavor, a black olive with sea salt bagel, along with the classics: Everything, sesame, poppy, onion, garlic, and cinnamon raisin. This week we sold out at about 1:00 pm so make sure to come by before noon to have the best selection of hand-rolled bagels! Is there a flavor you would like to see? Let us know! We are hoping to incorporate a few whole grain and gluten free items within the next few weeks, keep checking back for updates. We will be at the South Kona Green Market in Captain Cook, Hawaii, next weekend on 9/25/16 for another market session. Come by and try the best bagels on the Big Island!